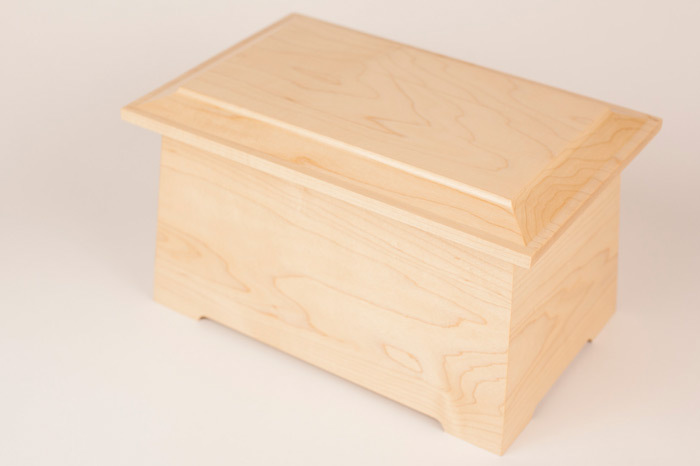 Let’s look at a few of these maple wood cremation urns. To start, here are two simple designs that highlight the wood itself. No engraved or inlay artwork, just the simplicity of gorgeous maple and American craftsmanship. The Sonata boasts a sublime “craftsman” style shape, a classic of the genre. Hearty, solid wood with a removeable access panel on the bottom, this urn exhudes elegance. Made in the USA, it holds a standard “adult urn” capacity of 200 cubic inches, and measures 9-3/4″ wide by 6-1/2″ deep by 6 1/2″ tall. Just like the Sonata, the Cambridge Urn presents maple wood in its simplest, most beautiful form with subtly worked accents and minimal adornments. 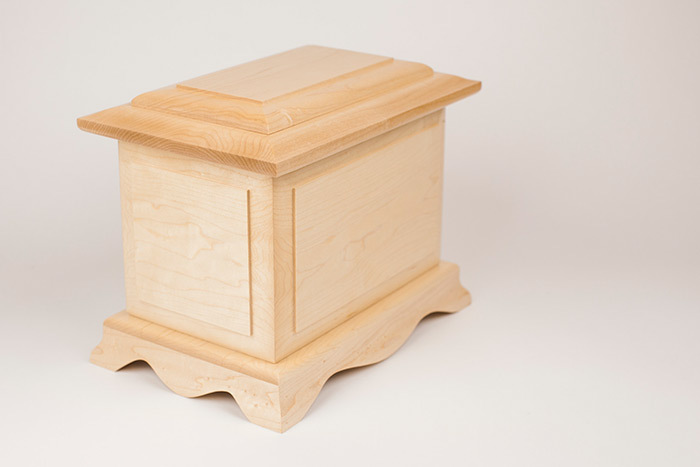 This is an urn that conveys restrained class, letting the maple wood breathe and speak for itself. Be sure to watch the video to see it all the way around. 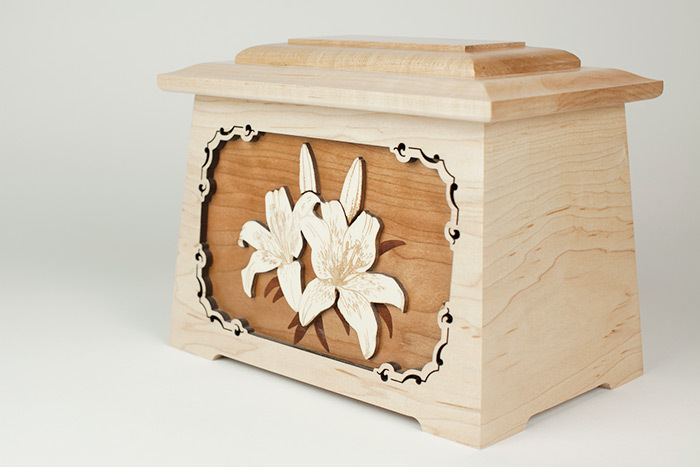 Maple is one of our four “staple” wood types for our 3-dimensional inlay wood art urns. We offer each art scene in several different box designs, each of which can be made using Oak, Mahogany, Walnut, and of course Maple wood. More info on our 3-dimensional inlay art urn sizes, shapes, and styles. Here is a smattering of photos and videos of various inlay art scenes (both 3-dimensional and traditional inlays) in maple wood. 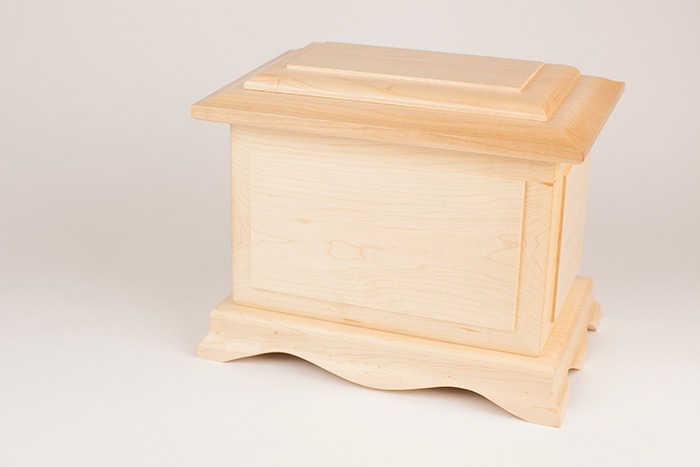 Remember, we offer all designs, all shapes, and all sizes of these urns in maple wood. Maple wood in the Astoria shape surrounds a background panel of cherry wood, with brightly colored hibiscus flowers etched from a separate layer of maple wood and stained pink. This is one of the very few times we utilize a stain for color; generally the wood used in these 3D inlay art scenes feature the wood’s natural color. This looks absolutely gorgeous in person, and the pink flowers with cherry-red background is accented perfectly by the maple wood of the urn box. A truly beautiful urn for a flower lover. Another style we offer is the Heirloom Clock. 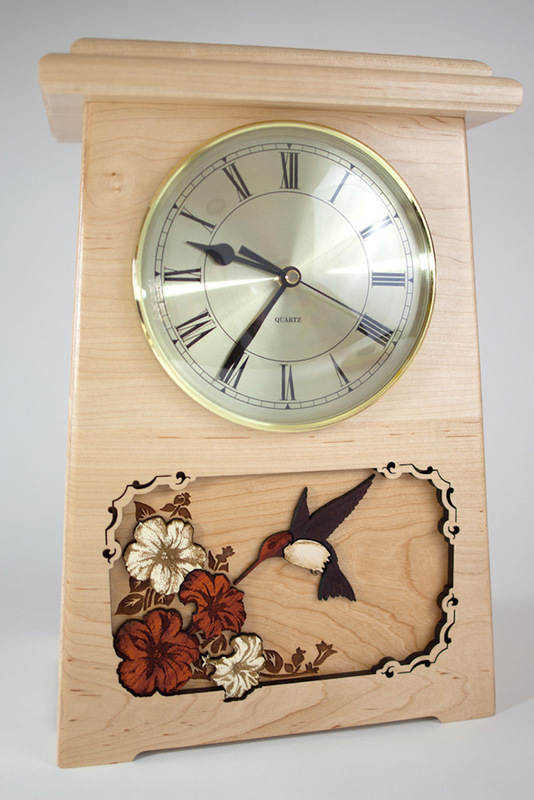 Shown above in Maple wood with the “Hummingbird” inlay art scene, this stunning urn is a little more discreet, allowing you to display the urn as a decorative clock rather than drawing attention to the fact that it is an urn. White lilies in three dimensions make the centerpiece of this urn. Maple wood for the box, cherry for the background (engraved in detail for the leaves), with maple again for the lily flowers. 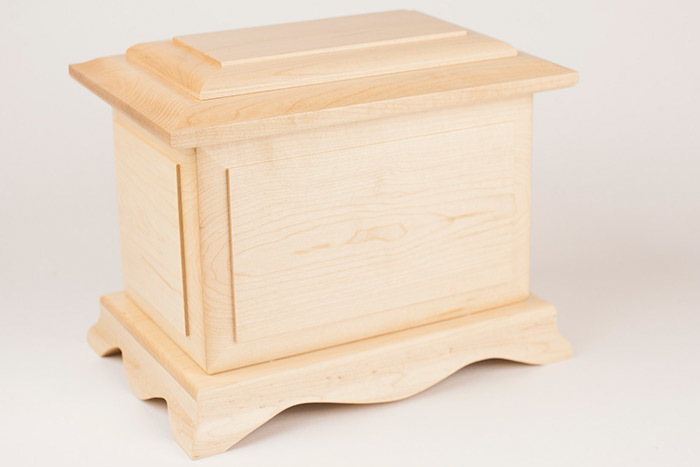 Another fine maple wood cremation urn made in the USA. This simple yet finely detailed inlay is only available in maple wood. 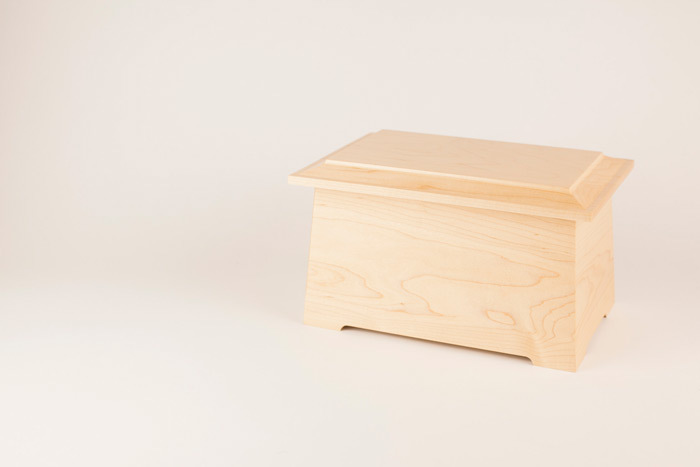 The cardinal bird is an inlay – set flush into the maple wood cremation urn box – made from Rosewood. The bird rests lightly on a branch of Walnut wood. 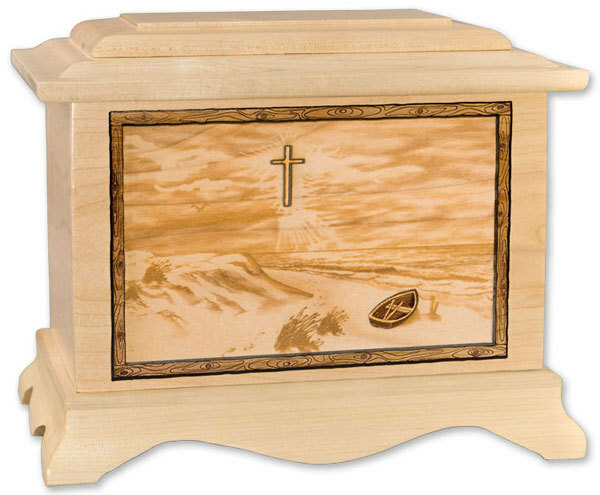 Crafted in the USA from real premium hardwoods, the Cardinal Wood Inlay Cremation Urn is one of our newest and most popular additions. This lovely beach scene is shown in the Ambassador shape, featuring a cherry wood border, engraved maple panel etched with a beach, boat, footprints, and cross wood art scene. 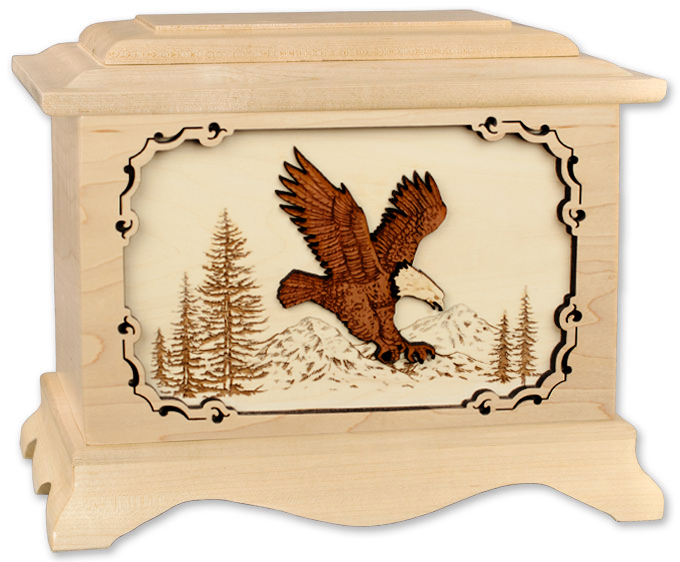 Another Ambassador shape urn in maple wood, this “Soaring Eagle” inlay art scene is crafted in the USA in fine detail using a 3-dimensional wood inlay of walnut and maple for the eagle. 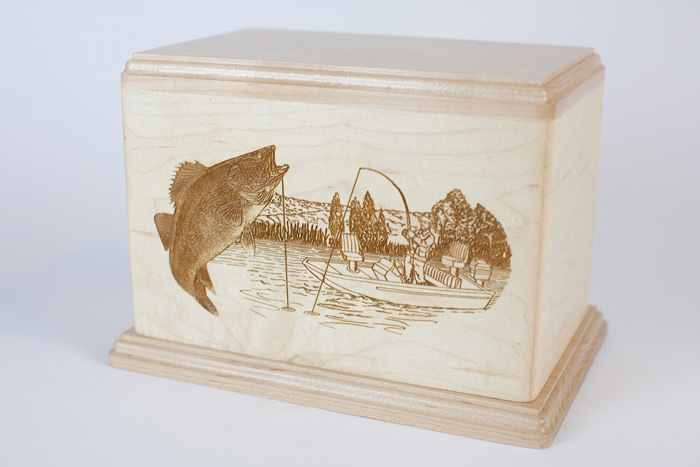 The Walleye Boat Fishing scene is just one of many popular artistic designs we laser carve onto these elegant maple wood cremation urn boxes. Crafted in the USA and deeply laser etched into the front surface of the urn, these are affordable yet uniquely suitable urns that cover a variety of interests. We have a variety of wood urns that you can engrave with a photo of your loved one. You can see the collection here, and general information on choosing a photo urn is here. 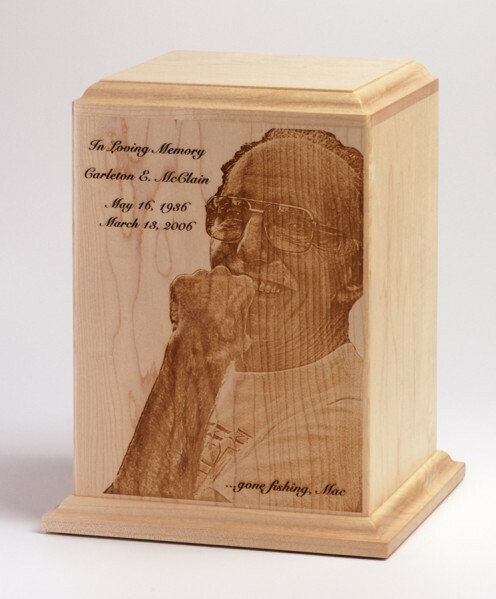 The urn pictured above is our most popular option, a gorgeous maple wood memorial engraved in perfect detail with a photo of your loved one along with a brief inscription. Made in the USA from thick, premium maple wood, this is a stunning choice to remember and honor your loved one. 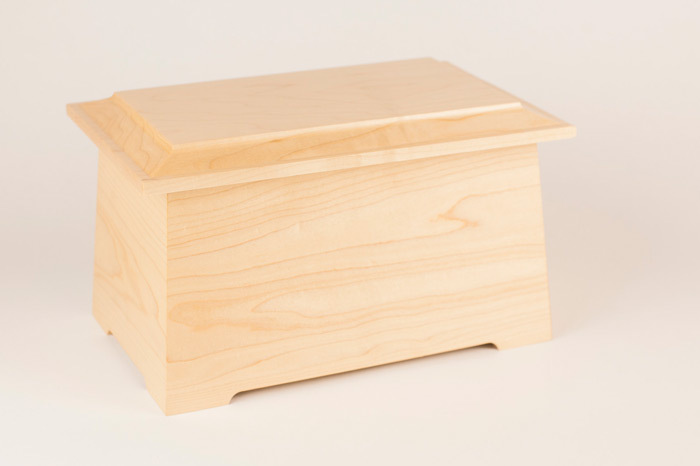 Check out all of our maple wood urns here!